It is quite the ordeal to get to the Isle of Iona — it literally requires planes, trains, automobiles, and ferries! I planned out very precisely how I would get there, googling timetables and emailing the West Caledonian bus company when their's wasn't available. Here was my route: plane from Raleigh to Detroit, plane from Detroit to London, train from London to Glasgow, train from Glasgow to Oban, overnight in Oban, ferry from Oban to Craignure, bus from Craignure to Fionnphort, ferry from Fionnphort to Iona. So imagine my joy when the first step in the UK hit a snag. Every single train from St. Pancras International was cancelled, including mine to Glasgow. I was tired and hungry and just wanted to be on my way, and instead I had been in a foreign country for an hour and all my travel plans were derailed. Naturally, I handled it in an extremely mature way — I sat on the floor of the train station and cried while texting my parents frantically. Once the dust settled, I walked to King's Cross and took a train from there to Edinburgh. Because of the cancellations, the train was super overcrowded. But, fun fact I learned, is that you aren't required to be in a seat for your train journeys in the United Kingdom. I spent three and a half hours (out of a four hour train ride) standing by the window of a train racing north. I chatted with a lovely woman going to meet up with her brother at their family home in the north of England and had enough good Instagram story content to keep me from going insane. From Edinburgh I took a short train ride to Glasgow and stayed the night there in a fancy treat-yo-self hotel. The next day ran without a hitch until (and you knew there would be an until) they informed us that all ferries from Fionnphort to Iona — the last leg of the journey! — were cancelled. Well... lo and behold. 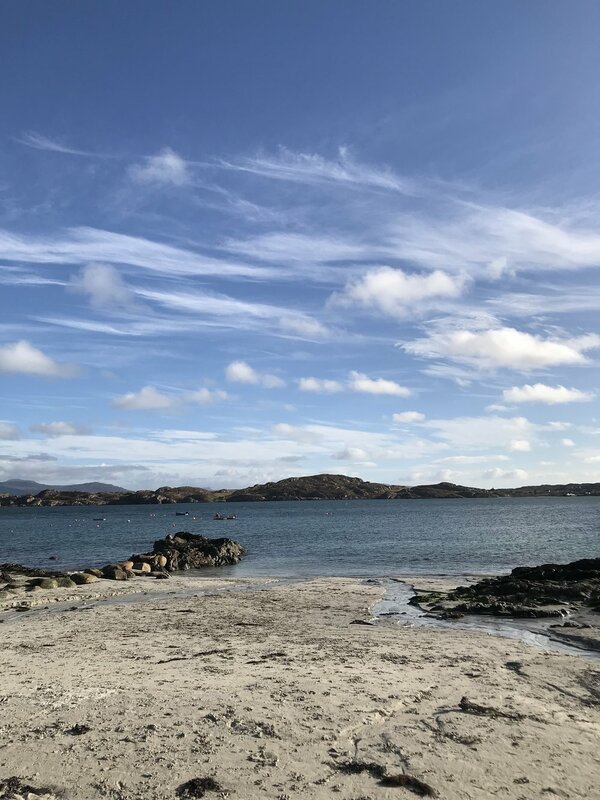 Mark, a fisherman who lives on the Isle of Iona, came to the rescue of me, a BBC radio producer, and half a dozen ladies going on retreat by taking us over the rough sound in his sailboat. I certainly know how to make a dramatic entrance. The train wasn't all bad. This is the view from the window of sunset in Berwick-upon-Tweed. After the pandemonium of arriving to Iona, my time on the fair isle was magical. I spent my time in Scotland with Helen, one of my dearest friends from UNC. We lived together when we studied abroad in London and travelled together during and after our program. She spent almost a year living in Iona and working as a parish and financial assistant supporting the Iona Abbey and community. I am so in awe of her adventurous spirit and fearlessness in new situations. She made incredible friends working there, and it was a privilege to meet with some of them while I was visiting. My time in Iona was perfect. I was there Saturday afternoon, Sunday, and Monday morning, so it was a short, hard-earned, and incredible visit. We had the most glorious weather on Sunday — brilliant blue skies and puffy clouds that let us spend the entire day out of doors. 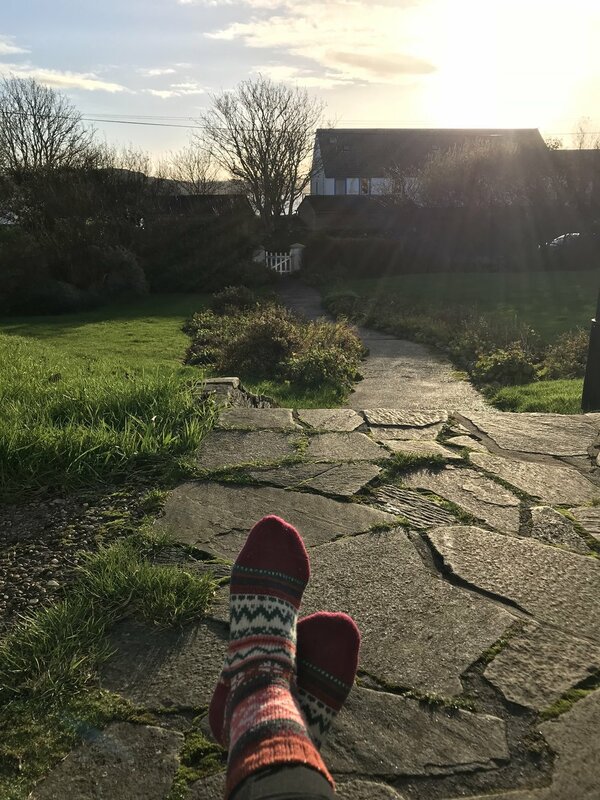 I read in the morning, lounging on the front stoop of the house where Helen and her coworkers lived in my wooly socks and pajamas. We moved slowly (vacation pace) but eventually left the house for a picnic and hike. We traipsed 7 miles, zig zagging across the island that is only 1 mile wide by 4 miles long. I thought it would be gentle rolling hills and sprawling landscapes — and part of it was. But Helen took me off the regular Iona trail walk path, to the beach and the old marble quarry and through the peat bogs. And I do literally mean through the peat bogs, as I took a tumble into the peat bog multiple times. 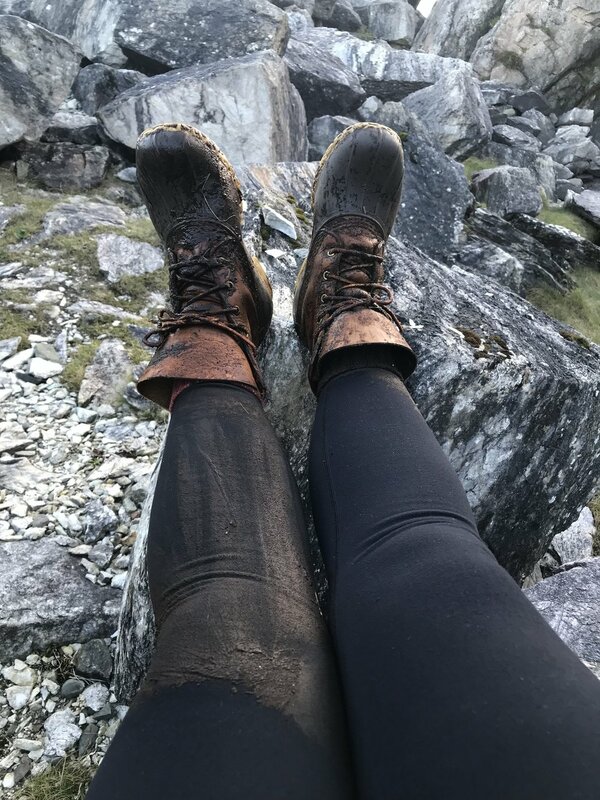 Even covered in peat and mud, I couldn't stop grinning and saying, "I'm just so happy. It's so beautiful. I'm just so happy." I'm sure I was driving Helen crazy. Iona was everything I wanted Prince Edward Island to be. It remains nearly untouched by modernity. Sure, there's wifi and Netflix, but people often leave their phones behind and just enjoy their setting and company. It's not at all commercialized — I think that's what was most jarring about PEI. It felt like a weird version of Myrtle Beach, with mini golf courses and water parks nestled in with the potato fields. Iona had that gorgeous sky and sea I was seeking and was entirely remote (seriously, its only attraction is a hundreds-year-old abbey). It was the best possible way to kick off my time in Scotland.